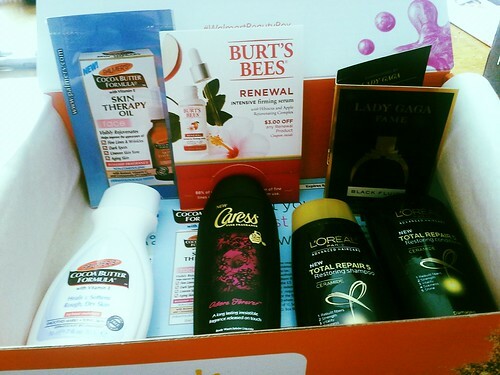 First off, I should note that I received this free for testing purposes from Influenster. I received this to try at the warmest point of summer and I was a bit skeptical about how well it would perform in the Michigan heat and humidity. Usually I’m sweating off whatever I put on my face within minutes. I was pleasantly surprised at the staying power of this foundation though. When I’d blot my face (as I frequently needed to do) there was minimal transfer of make up. And one of the biggest benefits was the lack of break outs! My skin tends to freak out about things and did fine with this product even after wearing it several days in a row. After hours of sweating and blotting, it does wear off (the photo on the left is after quite a few hours of wear on a very hot and sweaty day) but on a cooler day, it stays put. It will eventually start to look gross in my t zone (I get pretty oily there) but responds well to blotting papers. I would say that it gives light to medium coverage and is at least a little buildable, though I did not test that to it’s full capacity. I didn’t have too much extra to cover that needed a lot of building. It has a smooth, soft, not at all greasy texture. I would say this would be good for someone who likes a more matte finish, rather than dewy. I gave a bottle to my mother and she felt pretty meh about it. She prefers more of a dewy/oily finish and this does not give that at all. I would (and have already) purchase this again and would recommend it without hesitation. 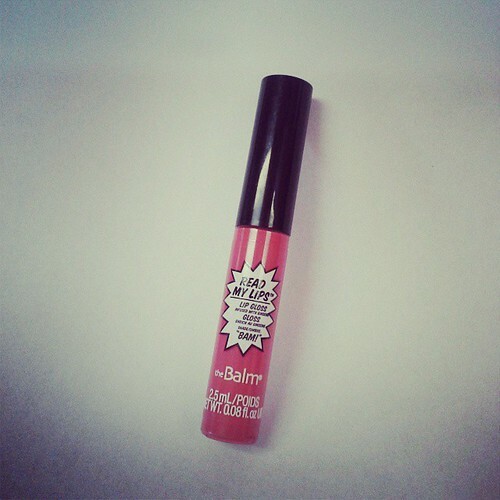 In my February Birchbox, I received a sample of The Balm’s Read My Lips gloss in BAM! and I LOVE it. The scent/taste is fantastic! It is delightfully fruity. The color is very natural and just a little lighter than a “my lips but better” shade would be. I will likely purchase it again and might try out the ZAAP! shade as well. ZAAP! looks like it has a bit of shimmer in it though and that might keep me away from that one. I also have my eye on GRRR! Alas, one negative note: the texture does nothing for me, as it has that sticky gloss feel that I’m not fond of. And for some reason, glosses with that texture seem to wear unevenly on different parts of my lips. I like an even uniform slip feel when I rub my lips together. Another note, since I’m just about to watch the most recent video, I’d like to recommend the What’s Up In Makeup series of videos from Jen Luv’s Reviews on YouTube. I have been loving these videos! I always find a few things I had not heard about yet that I want to check out. My latest thing has been YouTube. I have been watching many, many YouTube videos. And very recently, I have been watching many many beauty and make up channels. This has been awesome and inspiring and has made me want to get out my make up and play. It has also made me want to shop, and my budget is not really allowing that. Alas. But here are a few things that I *would* be snatching up if I could. The first time I fell in love with a perfume was around age 14. One of the ways my friends and I liked to spend our weekends was walking around the local mall. Around this time Elizabeth Taylor’s perfumes seemed to be pretty popular and one of the varieties that existed was Diamonds and Sapphires. I LOVED it. Every week, we’d wander through all the stores, and I’d spray myself with the sample. Eventually, when I was a little older, I got a bottle of it for Christmas. It was discontinued, though I’m told one can maybe still find it through the online discount perfume stores. I had forgotten just how much I loved it. Until the other night when I was walking around Meijer in search of a Wet & Wild eye shadow palette (which I did not find. I think I missed the boat on the after party palette.) and I passed a display of Coach fragrances. Two of the three were labeled fruity florals so I sprayed one on each wrist and went on about my business. Then I actually sniffed them. And one of them smells JUST LIKE DIAMONDS AND SAPPHIRES YOU GUYS. I kept sniffing my wrist and happily sighing. I went back to the display and sprayed myself more times than I’m going to admit to. Wrists, neck, coat. As much as I could with it being a stuck down sample bottle. I wanted to bathe in it and buy it on the spot. But I restrained myself. Because it was $45? I think? Maybe $42. More than I could justify at any rate. But that was fine, because then I found it for much less on Amazon and Sephora, which will make it much more do-able. Perhaps if I have any birthday money to spare. Coach Poppy Flower will be mine. Moving on to the make up! I just watched a video reviewing/swatching everything in this kit. Everything in it looks so pretty! It’s a lot more neutral than I tend to want to buy but there is a lot of shimmer, which I am definitely into. It includes a bunch of eye shadow, a couple blushes, a highlighter, a bronzer, 4 lip glosses, and a dual ended brush. It’s just under $60 and this is why it will not be coming home with me, much as I would love it. I’s still been on the sample kick and have had a lot of things that I’ve been intending to review. They’re coming. Hopefully. Maybe. We’ll see. I don’t think I’m a mascara kind of girl. It always looks clumpy to me, particularly when applied how “they” recommend with multiple coats. I think it’s clumpy after one, much less several! I like the *idea* though. I like the idea of my lashes being darkened and lengthened. Particularly since my lashes are long enough but really light at the tips so you can’t actually tell. But any time I’ve worn mascara, there’s the clumpy look to deal with and then I always forget and rub my eyes so I end up smudgy or with mascara in my eyes or both. Bleah! 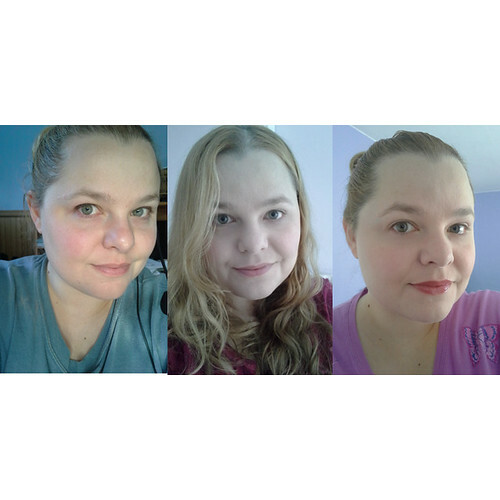 A while back I had a couple of formal occasions coming up so I decided to give some mascara another try. I’m a fan of Too Faced cosmetics in general so I acquired a tube of their Too Faced Lash Injection Pinpoint Mascara and hoped for the best. I figured it would be a good idea to give it a test run. So one evening when I didn’t have anywhere I had to be (which I figured would be good if this experiment didn’t turn out well), I curled my lashes and then applied my first coat. My first coat that ended up being my only coat because I almost immediately washed it off. It was kind of sticky and kind of gunky and definitely not the look I was going for. But I was determined to not give up! The next time I tried, I applied it so lightly I almost couldn’t see it. This was good, since it eliminated the gunky, crusty look. Bad because it lessened the lengthening possibilities. In the end, I decided that getting my lashes a little darker was the more important feature. My verdict: If you like and wear mascara, by all means give this one a try. It seemed to be very mascara-y! 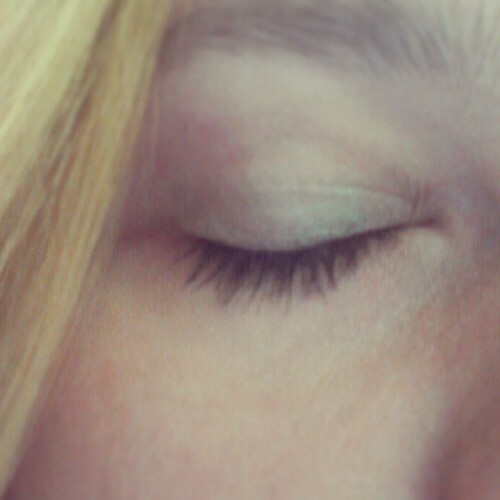 It did lengthen and darken my lashes. But with a price. Looking for gifts for the product whore in your life? I’ve put together a list of fabulous items for you! Christmas Party Bath Bomb – I love this bomb! It’s orangey and lovely and full of stars and confetti. I admit I put mine in a stocking before dropping it in the bath. But I’m lazy and don’t like to clean stuff out of my tub. And for a relaxing time *after* the bath, try a Soft Coeur Massage Bar! 2. Mason Pearson – Everyone should have one of these hair brushes. You can buy them on Amazon! This is the one I have: Mason Pearson Junior Bristle & Nylon Brush – I’ve had it for 14 years and I LOVE it. I also have the pocket version. 3. Bunny slippers! – I previously wrote about my awesome bunny slippers. Kipling Loves Too Faced cosmetic sets! 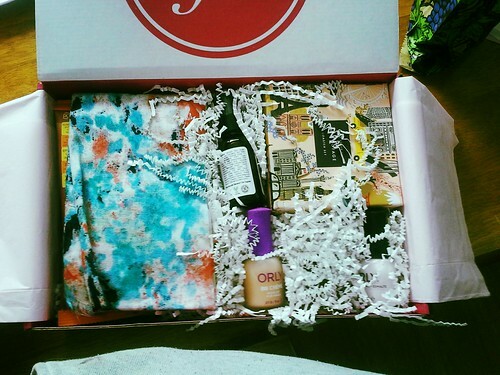 Each comes with Too Faced cosmetics tucked in a Kipling bag! 6. Escada Moon Sparkle – This is one of the very few non Black Phoenix Alchemy Lab perfumes that I have ever liked. I *love* this. It’s sort of fruity, sort of floral. I am terrible at describing scents. But this one is lovely. I just keep sniffing myself and sniffing myself. 7. Flowering Tea with Teapot and Warmer – This is so pretty. I would love to have one of these. I have a lot of tea so I haven’t been able to justify buying it. One of these days! Another fine tea place, Adagio Tea, has all sorts of great stuff. And you can get smaller sizes to sample or mix and match. Bonus! So there you have it! What are you thinking about buying this year?